What a national audience witnessed Thursday night at the GOP convention in Tampa was a flashback to the Golden Age of Hollywood and an unprecedented reflection of the national conscience that for years has been begging to be heard. Like the great actors of Hollywood who loved their country more than themselves. Like the great actors of yesterday who spoke so proudly of America. And like the great actors 0f the 1940s, Clint Eastwood took to the airwaves to broadcast his love for America and ask a worried nation to act in order to preserve the future of this great nation. 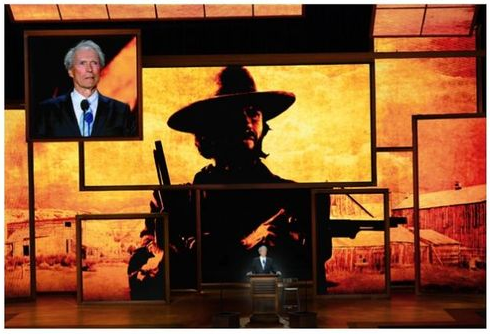 There’s no doubt that Mr. Eastwood’s performance was not his best. But also there can be no doubt that this performance was his most important. Unscripted and unrehearsed. No Director and no retakes. No stuntmen and no great music in the background to arouse our emotions. Yet it was to be Clint Eastwood’s greatest scene in his 57 year career.